Do you dream of luring a crew of sailors to their doom with your seductive siren song? Do you yearn to be the crowned sole princess of the underwater kingdom of Atlantis? Do you just look really, really good in fish scale print skirts? Maybe it's about time you considered becoming a mermaid. Not only do you get to become the charming creature of legend that no sailor can resist, but you also get to dress in fish scale print AND you get your shot at becoming the princess of an underwater kingdom. 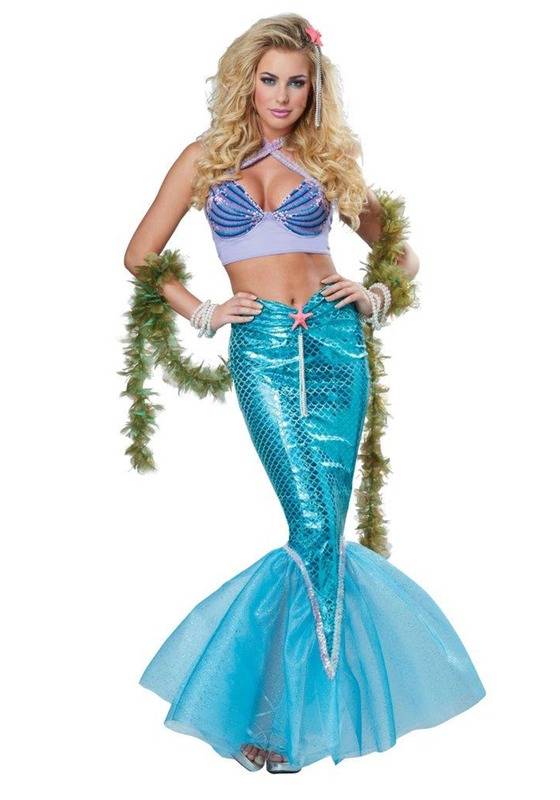 You also get to look super cute while doing it when you choose this Deluxe Mermaid Costume for women. The size is bigger than what it should be. The bra is nothing like the picture. The bottom part of the skirt (tail) is a complete mess and doesn't stay like the pic. It has SO MUCH glitter that it will get your entire room floor and anywhere it touches full of glitter!